If you have a cat, dog or both, you know that these types of pets really love getting treats. Treats are a good alternative for pets who are on a standard diet of kibble each and every day. They are also good for training, as a reward for doing the behaviors that we want them to do. However, it is important to be choosy when it comes to the treat options that you select for your pets. Some classic dog treats are excellent choices, providing natural dental care for pets in addition to the treatments you receive at the animal hospital in Dartmouth. If you aren’t sure which treats are best for your pet, you can always speak with your South Coast veterinarian for tips and suggestions. Sometimes the best way to find good treats is to know which ingredients to avoid. We all know that dog food companies have been under fire in recent years for using poor quality ingredients. The companies that make treats have had similar issues. Make sure to avoid by-products whenever possible, that includes animal by-products and grain by-products, including crude protein and more descriptive chicken by-products. Crude protein is the pet food version of the “pink slime” that has been associated with fast food. It is basically waste from the slaughterhouse, whatever happens to be leftover after processing. It should be avoided at all costs. It is important for New Bedford pet owners to learn all they can about the healthy guidelines established for giving treats to dogs and cats. While each pet should be considered as an individual through a check-up provided by your local South Coast veterinarian, the rule of thumb is that treats should not comprise more than five percent of your pet’s daily diet and nutrition. Treats should also not be a substitute for healthy food or exercise, which are essential to your pet’s overall well-being and longevity. 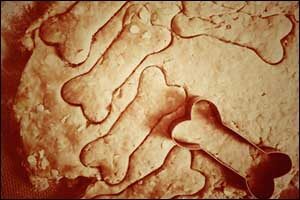 Take time to research which pet treats are best for your dog or cat. Some treats have too much sugar, which can lead to expensive and possibly life-threatening dental care for pets, as well as obesity and diabetes. Ask your vet about a list of dangerous human foods that should be avoided at all costs, such as chocolate, coffee, raisins, grapes and much more. Consider using pet-safe recipes to make your own homemade treats so you will know for sure what ingredients are used for a proper balance of nutrition. Ingredients for these treats include: half-cup of peanut butter, quarter-cup of honey, one tablespoon of coconut or olive oil, one cup of chicken broth, one cup of rolled oats, one cup of whole wheat flour, and one cup of all-purpose flour. Just whisk the peanut butter, honey, oil and broth together and add the dry ingredients, mixing until well-combined. Roll out onto a floured surface to about a quarter of an inch thickness. Cut with a small cookie cutter, approximately two inches for small dogs or a bigger cutter, like four to five inches, for larger dogs. Bake at 350 degrees for 14-16 minutes and cool completely. Can be stored in an airtight container in the fridge for up to two weeks. Ingredients for these treats include: one cup whole wheat flour, a six-ounce can of tuna in oil that is not drained, one tablespoon of oil, and one egg. Combine all ingredients together to make a dough. Roll out on a floured surface to about a quarter of an inch thickness. Cut with a small one-inch cookie cutter or use a pizza cutter to create small one-inch diamond shapes or squares. Bake at 350 degrees for 20 minutes or until firm and cool completely. Can be stored in an airtight container in the fridge for up to two weeks. If you have any questions about healthy diet and treat options for your pets, visit your local South Coast veterinarian. They can provide you with suggestions for food types, brands and feeding amounts, as well as regular check-ups, vaccinations and dental care for pets. New Bedford pet owners and pet owners from the surrounding South Coast region have trusted the veterinarians and staff at Anchor Animal Hospital in Dartmouth since 1975. Give us a call at 508-996-3731 to schedule an appointment or to learn more about our services.